Senecio is the largest genus in the Asteraceae family growing in all environments around the world. It displays taxonomic and systematical difficulties. Cytogenetic knowledge of this genus is ancient, scarce and mainly restricted to chromosome number records. In this study we analyzed chromosome number, meiotic configuration, bivalent morphology, meiotic behavior and pollen grain stainability on 100 accessions of 27 different polyploid Senecio L. sect Senecio entities. Median, standard deviation and mode were calculated for number and position of chiasmata and meiotic recombination was statistically evaluated. Although high frequency of multivalents and associated meiotic irregularities are expected in high polyploids, bivalents predominance and, consequently, regular meiosis were observed, with normal sporogenesis and high pollen grain stainability. Depletion in the total chiasmata was significant only in some species but the terminal position was preferential in all the entities analyzed, indicating significant reduction in recombination. The regular meiosis observed suggest that intra and intergenomic reorganization process occur quickly and efficiently in this genus. Mechanisms of diploidization, common to all polyploids, are reinforced by the strong reduction in crossing-over rushing polyploids stabilization. Senecio L. is a cosmopolitan genus described by Linné in 1753. It grows in all the regions with the exception of South Pacific Islands and Antarctica, although shows the highest specific richness in the mountain areas (Cabrera et al., 1999). The number of species belonging to Senecio is controversial, ranging from 1000 to up 3000, mainly because the extremely difficult taxonomy and systematics. Nevertheless this debate, different authors agree that it is the largest genus of the Asteraceae family (Bremer 1994; Cabrera et al., 1999; Nordenstam, 2007; Pelser et al., 2007). Medicinal, ornamental, noxious plants and weeds fit into this group giving it, in addition to the ecological value, an economical interest. At the cytogenetic level the modal chromosome numbers in Senecio are 2n = 40 and 2n = 80 (Bolkhovskikh et al., 1974). Polyploidy is one of the most notorious features in the genus (Lawrence, 1980; 1985) and x = 5, the accepted basic chromosome number (López et al., 2008a). Even when in the last years some works were published, mostly about Argentine species (López et al., 2002; 2005; 2008a; 2008b) cytogenetic knowledge of Senecio in the world is still scarce and ancient (see López, Citogenetics, Evolutive and Biosistematical Studies in Senecio sect. Senecio serie Corymbosi, from Argentina. 2008. Unpublished PhD Thesis University of Buenos Aires. Argentina for complete revision) and mainly restricted to chromosome number records. It has been suggested that deeper cytogenetic analyses would be very useful in order to understand the evolution and clarify the taxonomic complexity in this diverse taxon (López et al., 2008a; 2008b). Polyploidy has received special interest during the last decade, assigning it the main role in relation to the evolution of the angiosperms. It is considered an important speciogenic force and the major source of genetic variability in plants (Heslop-Harrison Pat and Schwarzacher 2011). Otherwise the old thoughts emphasized variability in the combination of genomes occurring in polyploids (Stebbins, 1980; Grant, 1989), more recent approaches highlight the recurrent formation of polyploids (Ashton and Abott 1992), the huge genomic reorganization caused by the interaction between genomes and the epigenetic modification as central resources of variability associated to polyploidy (Soltis and Soltis, 1999; Wendel 2000; Soltis et al., 2003; Kovarik et al., 2005; Tate et al., 2005; Hegarty et al., 2006; Chen et al. 2007). A lot of knowledge about Senecio has been generated from molecular data. On the other hand, cytogenetic behavior in polyploids and the consequences of the chromosome genomic rearrangement are less understood. In this sense, previous studies revealed chiasmata excess in taxa from this genus and suggested a chromosome exchange preferentially placed in terminal position (López et al., 2005). Since both events are determinant in the chromosome recombination, their estimation result extremely interesting because could explain the sterility avoidance caused by meiotic alterations, and therefore the maintenance and success of polyploidy species in the nature. Since Senecio is a genus plenty of polyploid species and notably successful worldwide, our main interest is to present a detailed cytogenetic characterization of several of its species, with special emphasis in the meiotic features, with the objective of understand the task of chromosomes in their success and permanence. Plant materials, including 27 entities, were collected between 2001 and 2006 in different provinces of Argentina (Appendix 1). Voucher specimens were identified, labeled and deposited at the herbaria SI or BAFC. Young capitula were fixed in situ in ethanol-chloroform-glacial acetic acid (6:3:1) for at least 24 hs, transferred to ethanol 70% (v/v) and stored at 4°C until used. Preparations were obtained squashing immature anthers in a drop of a 2% propionic acidhaematoxylin solution and using ferric acid as mordant (Núñez 1968). Cytogenetic analyses were performed taking into account a minimum of 50 pollen mother cells (PMCs) per species at different meiotic stages. Slides were observed and photographed using an optic photomicroscope Leica BMLD and a Leica DFC 350 FX digital camera. This study included determination of chromosome numbers, meiotic configurations, bivalents morphology and meiotic behavior. Median, standard deviation and mode were calculated for the number and the position of chiasmata. Pollen grain stainability was studied with Alexander’s differential staining method (Alexander, 1969). We tested two hypotheses, taking into consideration that the number and the position of chiasmata occurs randomly (i.e. p = 0.5), as is expected in the meiotic process. For the first hypothesis, z1 was defined as the proportion of open bivalents and in the second one, z2, as the proportion of interstitial chiasmata. In order to minimize the differences in chiasmata occurrence during meiosis, open bivalents and chiasmata position were determined mainly in diakinesis and also in prometaphase I, in cells where those items could be undoubtedly determined. 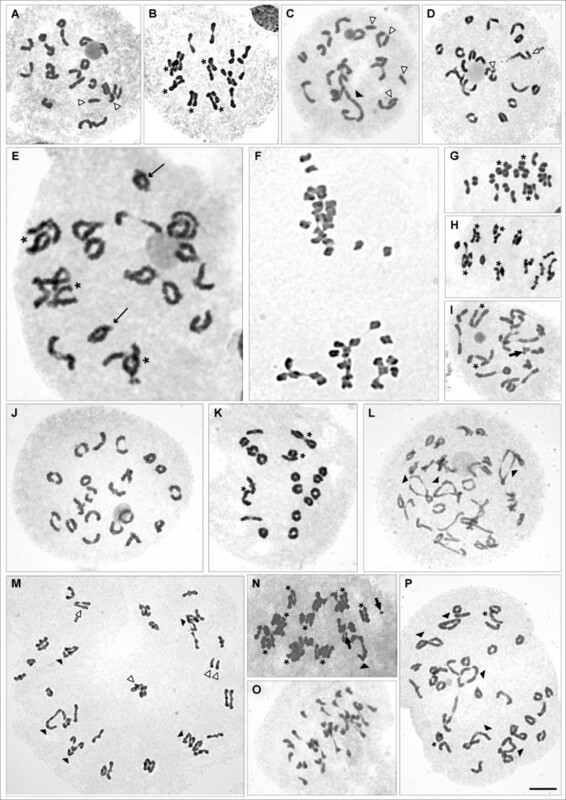 Previous published chromosome number reports were included in this report in order to enlarging the discussion of this cytogenetic study and the meiotic recombination analysis. Complete cytogenetic analysis is summarized in Table 1. Only two different sporophytic numbers (2n) were observed, 2n = 40 and 2n = 80. New records on chromosome number were presented for: S. eruciformis var. brachycephalus (Figure 1A), S. eruciformis var. eruciformis (Figure 1B), S. grisebachii var. schizotus (Figure 1C), S. linariifolius var. subtomentosus (Figure 1D), S. glaber (Figure 1E), S. riojanus (Figure 1F), S. ganganensis (Figure 1G), S. goldsackii (Figure 1H), S. grisebachii var. leptotus (Figure 1I); S. brasiliensis var. tripartitus (Figure 1J) and S. melanopotamicus (Figure 1K) with 2n = 40; S. subulatus var. salsus (Figure1L), S. viridis var. viridis (Figure 1M) and S. microphyllus (Figure 1N) with 2n = 80 and, S. subulatus var. erectus which exhibited cytotypes with both chromosome numbers (Figure 1O-P, Table 1). Polymorphism for B chromosomes was also observed in some entities (Table 1, Figure 1I, 1N). Although diverse meiotic figures were identified, from univalents (I) to hexavalents (VI) and one decavalent (X), bivalent (II) was the most frequent chromosome pairing (Table 1, Figure 1A-P). Interstitial chiasmata and close bivalents were also marked in the cells used to recombinant analysis (Figure 1A-P). In the first column. numbers in parentheses indicate the number of individuals and cells. respectively. analyzed in each taxon. Chromosome number (2n); meiotic configurations and corresponding percentage. Media ( x ¯ ). standard deviation (sd) and mode (M) of total chiasmata per cell and interstitial chiasmata (interstitical ch.). range of instestitial chiasmata in parentheses. both statistics values z1 and z2 and percentage of pollen stainability are shown. *chromosome record already published by the authors. ++significant values (p < 0.05). z1: proportion of open bivalents. z2: proportion of interstitial chiasmata. Cytogenetic analysis of Senecio sect. Senecio taxa. A: S. eruciformis var. brachycephalus, diakinesis with 19 II + 2 I. B: S. eruciformis var. eruciformis, metaphase I with 20 II. C: S. grisebachii var. schizotus, diakinesis with 16 II + 1IV + 4 I. D: S. linariifolius var. subtomentosus, diakinesis with 18 II + 1 III + 1 I. E: S. glaber, diakinesis with 20 II. F: S. riojanus, prometaphase II with 20 chromosomes in each pole. G: S. ganganensis, prometaphase I with 20 II. H: S. goldsackii, metaphase I with 20 II. I: S. grisebachii var. leptotus, diakinesis with 20 II + 3 B chromosomes (1 IIB + 1 IB). J: S. brasiliensis var. tripartitus, diakinesis with 20 II. K: S. melanopotamicus, diakinesis with 20 II. L S. subulatus var. salsus, diakinesis with 34 II + 3 IV. M: S. viridis var. viridis, prometaphase I with 27 II + 5 IV + 1 III + 3 I, displaying evident secondary association of bivalents. N: S. microphyllus, metaphase I with 38 II + 1 IV + 2 IB. O: S. subulatus var erectus cytotype 2n = 40, late metaphase I with 20 II. P: S. subulatus var. erectus cytotype 2n = 80, diakinesis with 30 II + 5 IV. Asterisks indicate secondary association of bivalents; white triangles indicate univalents (I); line arrows indicate heteromorphic bivalents; black triangles indicate quadrivalents (IV); tick white arrows indicate trivalents (III); thick black arrows indicate B chromosomes; c: close bivalents; qi: interstitial chiasmata. Bars = 10 μm. Meiotic behavior was carefully examined in all the new recorded entities except in S. riojanus because of the scarce material in adequate maturation condition. The majority of the individuals exhibited bivalents secondarily associated (Figure 1B, E, G-I, K, M-N, P). Heteromorphic bivalents (Figure 1E) were observed in all the taxa with 2n = 40, with exception of S. ganganensis, S. linariifolius var. subtomentosus and S. subulatus var. salsus. Completely regular meiosis was seen in Senecio eruciformis var. brachycephalus, S. ganganensis, S. goldsackii, S. grisebachii var. schizotus, S. viridis var. viridis and S. subulatus var. erectus. 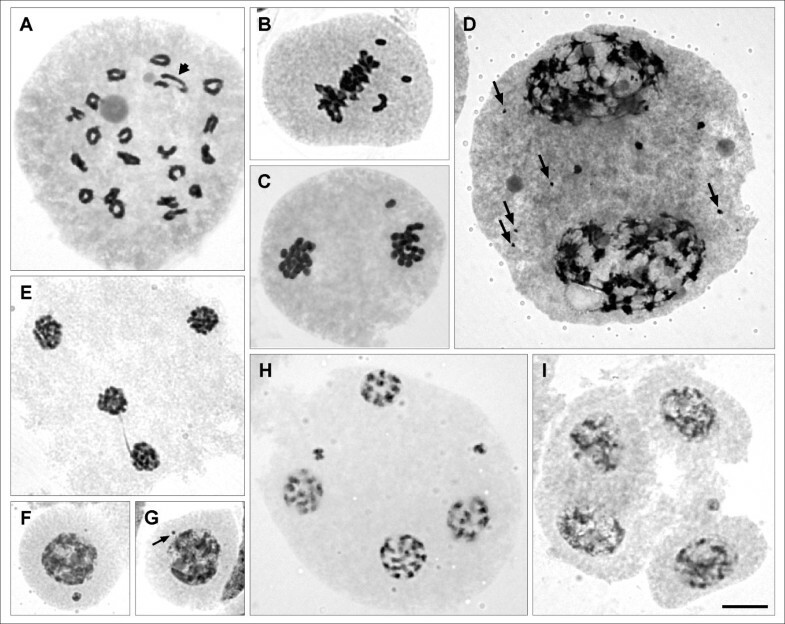 In some species, meiotic irregularities such as, chromosome breakage (Figure 2A); bivalents out of plate at metaphase I (Figure 2B); lagged chromosomes at anaphase I and II; chromosomes excluded to the nucleus at telophase I (Figure 2C) and prophase II (Figure 2D); bridges at Telophase II (Figure 2E); micronuclei at Telophase I, Prophase II, Telophase II (Figure 2H), tetrads (Figure 2I) and microsporocytes (Figure 2F, G) were observed, although infrequently. In species with B chromosomes, they were excluded from the nucleus and remain as micronuclei after Telophase. Meiotic behavior of the other entities included in this paper was described in previous publications (López et al., 2002; 2005; 2008b). Pollen stainability was higher than 70% in all the species. Meiotic behavior of Senecio sect. Senecio taxa. A: S. melanopotamicus, diakinesis with 20 II, arrow indicate chromosome breakage. B: S. goldsackii, metaphase I, 1 II and 2 I out of plate. C: S. melanopotamicus, telophase I, a chromosome not included in a pole. D: S. microphyllus, prophase II with A and B (arrows) chromosomes not included in cell poles. E: S. goldsackii, telophase II with a bridge. F-G: S. subulatus var. erectus, F: microsporocyte with one big micronucleus (A chromosome); G: microsporocyte with one small micronucleus (arrow, B chromosome). H: S. ganganensis, telophase II with micronuclei. I: S. eruciformis var. brachycephalus, tetrads with one micronucleus. Bars = 10 μm. Values of median and mode of chiasmata per cell were similar in all the cases. The statistics z1 was significant (p < 0.05) only in 7 entities (Table 1) and negative in all of them, indicating that the number of open bivalents was higher than the expected by random. Median and mode of interstitial chiasmata per cell were low for all species analyzed, ranging from 1.2 to 13.7 and from 0 to16 respectively, with high data dispersion. The statistics z2 was significant (p < 0.05) and positive in all cases, indicating a reduction in the interstitial chiasmata in relation with the expected by random, and as a consequence the predominance of chiasmata in terminal position. Strong evidence supporting x = 5 as the basic chromosome number in the genus Senecio has been recently published (López et al., 2008a). Considering this statement, the species here studied displayed ploidy levels 8x and 16x, and, chromosome numbers 2n = 40 and 2n = 80 respectively, both of them in accordance with the modal numbers of the genus (Bolkhovskikh et al., 1974). It is noticeable the existence of two S. subulatus varieties presenting both chromosome numbers. These data represent the first reports of cytotypes for this genus in Argentina. This polymorphic species comprises three varieties coexisting sympatrically in nature, mostly in Mendoza province, but practically indistinguishable, except by minor differences in the capitula. Further analyses of the infraspecific taxa will contribute to solve the taxonomic and cytogenetic controversies but the existence of different ecological or environmental patterns could explain the presence of both cytotypes in the same place (Schönswetter et al., 2007; Suda et al., 2007). Even when high frequency of multivalents and the meiotic irregularities associated are expected in elevated polyploids, bivalents predominance and consequently regular meiosis were observed in this analysis and in the previous ones conducted in Senecio (López et al., 2002; 2005; 2008a). The documented meiotic irregularities can be mainly consequence of the structural rearrangements occurring between genomes, such as translocations, paracentric inversions, deletions, and insertions among others, which have been recorded for other polyploids by several authors (Stebbins, 1980; Thompson and Lumaret, 1992; Soltis and Soltis, 1993; Comes and Abbott, 1999; López et al., 2002). Frequently, the lagged chromosomes and the micronuclei were associated with B chromosomes suggesting a particular behavior of them to remain excluded from the nucleus. The scarce meiotic irregularities had not, apparently effect over pollen grain integrity as revealing by the high stainaiblity values observed. The abundance of bivalents linked to their outstanding secondary association revealed a diploidized behavior in these species and, this was in accordance with data previously published (Riley and Chapman 1958; López et al., 2002; 2008a). This particularity could be interpreted as reduction in crossing-over and consequently decrease in the number chiasmata per cell. Depletion in the total chiasmata was significant only in some species but the terminal position was preferential in all the Senecio entities analyzed. Both parameters indicate a significant reduction in recombination. In the first case, less chiasmata imply clearly less crossing-over in the second case, restriction to the terminal position limit the interchange to a small segment, keeping most of the chromosome length almost invariable. Although these polyploids underwent a substantial reduction in genetic recombination, there was not a notorius loss of variability sentencing these species to disappearance. On one hand, chromosome orientation in metaphase I is a source of variability and it is not affected by polyploidy. Conversely, the increase in chromosome number enlarges the potential combinations. On the other hand, polyploids have exclusive resources to obtain variability including hybridization, recurrent formation, genomic reorganization and new expression patterns (Soltis and Soltis, 1993; 1999; Wendel, 2000; Soltis et al., 2003; Kovarik et al., 2005; Tate et al., 2005; Hegarty et al., 2006; Chen et al. 2007; López et al., 2008b). In addition, recombination restricted to chromosome terminal positions could favor the maintenance of adaptative gene combinations over generations. The surprisingly regular meiosis observed would suggest that intra and intergenomic reorganization process occur quickly and efficiently in the genus Senecio modifying chromosome homology and probably favoring a diploidized behavior. B chromosomes have been linked with this particular chromosome behavior (Gupta, 1981), but this relationship is not evident in Senecio. Moreover, a different factor has been proposed in relation with it, the existence of Ph like genes (Moore, 1998; Sybenga, 1999; Al-Kaff et al., 2008). Although they have not been described yet in the genus Senecio, their effect on the promoting of diploidized behavior could not be discarded. Processes producing diploidized behavior avoid the sterility associated to high polyploids and maintain advantage adaptative allele combinations, ensuring species success, stabilization and establishment in nature (Stebbins, 1980; Thompson and Lumaret, 1992; Comes and Abbott 1999; Soltis and Soltis, 19931999). Especially, in the genus Senecio, the mechanisms of diploidization are accelerated by a strong reduction in crossing over, process evidenced in the present work. List of Senecio specimens analysed, collection data, voucher number and herbaria where they are deposited in parentheses. All the specimens were collected in Argentina. S. riojanus Cabrera var. Riojanus. Mendoza San Rafael. Puesto Vega del Burro, Ayo. Las Mangas, AFW & MGL 1211 (SI). This work was supported by grants from the National Research Council (CONICET), the National University of Buenos Aires and the Myndel Botanical Foundation. The authors are grateful to Dr. Fernando Zuloaga and personal of the Botanical Institute Darwinion (IBODA), Dra. Marta Arias from Miguel Lillo Foundation, Ing. Agr. Fidel Roig †, Ing. Agr. Iris Peralta, Sr. Gualberto Zalazar and Sr. Juan Antunez from IADIZA. They also thank Dr. Javier Calcagno for advice in statistical matters. AFW would like to thank Dr. Roberto Kiesling who kindly invited him to a trip collection at the San Juan Province. ML participated in the study design, carried out the cytogenetic preparations, performed the statystical analysis and drafted the manuscript. CX coordinated the study and helped to draft the manuscript. LP revisied the manuscript critically for important intellectual content. AW conceived of the study, and participated in the analysis and interpretation of data. All authors read and approved the final manuscript.